I was the proverbial fish out of water when I arrived at Corvallis, Oregon, in the fall of 1968 to begin my career as a graduate student in the zoology department at Oregon State University. I knew what research I wanted to do for my doctoral dissertation, which would involve extensive field work searching for Pacific Giant Salamanders. Being from the desert regions of the Snake River plains in southern Idaho, however, I didn't know much about the coniferous forests of western Oregon, where I wanted to begin my search for populations of the big salamanders. Despite that, I had heard stories from professors at my previous university in Washington state about a nearly mythical guy who lived in the Corvallis area, and who was associated with forestry and biological sciences at Oregon State University. His name was Chris Maser, and he was part mountain man, part field biologist, and a scholar who published papers on a wide variety of topics in the broad field of natural history. I was advised to contact him if I wanted to learn anything about the forests of western Oregon, including where to find salamanders. Well, unfortunately, I have to make this long story short, so here goes. I was soon introduced to Chris and found him to be a formidable but accommodating character. I explained to him that I needed to find many populations of the salamander in order to do my intended work on the diversity and evolution of the species. To my delight, I learned that he not only knew the habitat of the Pacific Giant Salamander but also knew quite a lot about them … a surprise because I thought he was primarily a mammologist. Chris offered to provide suggestions to where I might find my salamanders in the Coastal and Cascades Mountains of Oregon. But, he told me that he was a mite busy at the moment, compiling information for various projects, and he suggested that I accompany him on one or two of his field trips, so that I might start to become familiar with the forests of western Oregon. He first suggested that we go look for tree mice and try to capture some for study. Tree mice?? I had never heard of such critters and wondered if he was yarning me. The idea of mice living way up in trees just didn't seem right to me. But, it turned out he was serious. At McDonald Forest, just north of Corvallis, Chris found sign of red tree mice (actually voles of the species Arborimus longicaudus) near a tall Douglas fir tree, and he proposed that I climb up and drive the vole, or voles, down the tree and he would catch them. Whoa … he wanted me to climb up to near the top of a Douglas fir and scare down a small rodent … me … a flatlander who had never climbed a conifer before in my life and certainly not one that was well over 100 feet tall … and me with more than a touch of acrophobia? As I walked around the tree looking up near the top and getting a little bit dizzy, I glanced over at Chris who was looking at me from beneath the brim of his battered cowboy/mountain man hat with what I later learned was an expression of wry amusement. It suddenly dawned on me that this was a sort of test, and that I better not fail. As I clung precariously to the trunk of the tree some 80 to 100 feet above ground, I had no idea what to do to cause the tree voles to descend, but I did something right, and Chris was able to capture one of the desired, beautiful voles as it ran down the tree ahead of me. When I returned shakily to mother earth, Chris gave me a big smile and a couple of slight nods of his head accompanied with a soft click of his cheek, and I knew I had passed the test. Subsequently, Chris was of enormous help in providing me with information and inspiration that guided me with my dissertation field research. We became friends and colleagues and published two short notes together in 1969 (Water Shrews preying on larvae of the Pacific Giant Salamander) and 1975 (food habits of Bobcats in the forests of western Oregon) and a third more substantial report in 1978 with James Trappe on the importance of small mammals in the dispersal of root mycorrhizal fungi in the coniferous forests of Oregon. Chris has lived and worked in many countries and has written or coauthored 43 books and over 250 papers on natural history and conservation that are of great interest. He is also busy on the lecture circuit and has presented many seminal lectures, mainly on conservation issues, all over the world. This book is an important, almost necessary, chapter in the saga of Chris Maser. It tells the story of his youth, growing up in the environs of the Marys River in the upper Willamette Valley of Oregon. In the book, Chris pays homage to his childhood friend, Billy Savage, with whom he explored a ditch, cow pasture, and stream near Billy's home, southwest of Corvallis. There is a poignant moment when entering the 6th grade, Chris learns that his friend Billy has died. Chris's poetic words, steeped in the loss of his beloved friend, describing their time together exploring the ditch, cow pasture, and stream of their youth, are beautiful and mesmerizing. It becomes clear that Billy Savage was instrumental in imparting Chris along his trajectory to becoming a fiercely independent thinker and highly competent naturalist of the John Muir ilk. It is hard to be around Chris for long without being reminded of the mountain men who were at one with nature during the opening of the American West. Chris does not dwell on the loss of his friend, but instead celebrates Billy's life by writing a book that is a highly personal and detailed account of the riverine habitats and the wildlife Chris encountered along "The River of [his] Youth"—after Billy's death. Chris gives us a remarkable picture of the lives of the inhabitants of the river through the seasons and a portrait of the changes in the environment through time. He describes the life histories of about 75 species of animals and their diverse occupancy, or niches, in the riverine habitat through the seasons. The species include mammals, both large and small, birds ranging in variety from soaring raptors, such as the Golden Eagle, to graceful waterfowl, to the smallest of woodland songbirds like the Bushtit. Also, included among the vertebrates are amphibians like the Rough-Skinned Newt and the Pacific Tree Frog and reptiles, such as the Pond Turtle, Southern Alligator Lizard, and Sharp-Tailed Snake. Furthermore, animals without backbones (invertebrates) were included in Chris's scrutiny as he explored the river night and day, himself becoming one of the creatures of this magical place. He describes the appearance and lives of pearlshell mussels, earthworms, pseudoscorpions, hymenoptera (wasps, hornets, and yellowjackets), and water skaters (striders) with the clarity and beauty that only a skilled observer of nature can accomplish. Included as a fascinating aside is a mini-treatise on the "evolutionary miracle" of the bird's egg, which will undoubtedly change forever the reader's perception of what an egg is all about. Chris's descriptions of these animals and their ways are precious in that he writes with the soul and intimacy of a man who is practically one with these creatures that he so clearly loves. The book is based primarily on Chris's personal knowledge of these species and their changing environment through the seasons, but he also includes information about them that he has gleaned from his later scientific research and from the literature, when it is appropriate. And, sadly, the book is also an invaluable documentary of a natural world that no longer exists in its pristine state. One need only view the Marys River, as it is today in the area near Corvallis, to see the truth in that. I highly recommended this book to anyone who has an interest in natural history, and especially to those who are interested in the fauna of the Pacific Northwest. Those who have read others of Chris Maser's books will certainly want to read this one, as it describes the beginnings of Chris Maser. Have You Ever Wondered Why Geese Fly in Formation? A Yellowjacket Encounter to Remember! 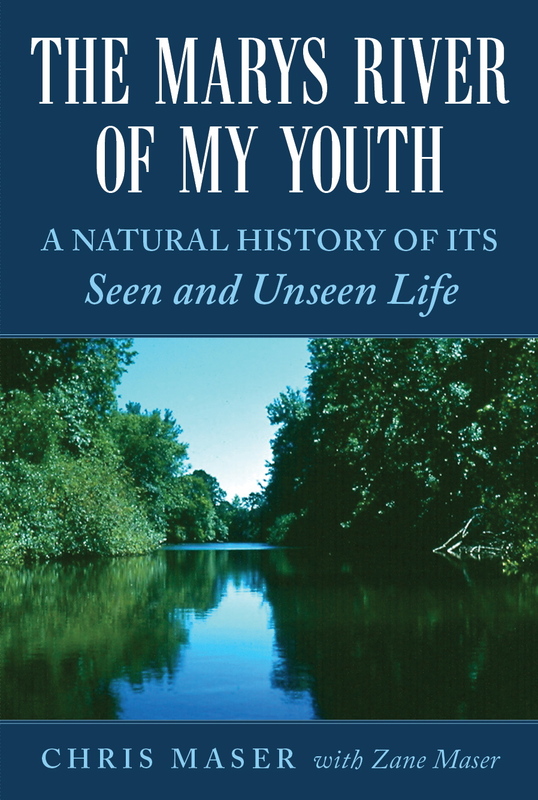 "Along the way, his in-depth descriptions of the inhabitants in the river and along its banks, include their lifecycles, nesting habits, physical descriptions and behavioral patterns. His descriptions are so thorough, the reader gains a substantial body of knowledge. Whether it walks, crawls, flies, slithers or swims, the information is interesting, informative and detailed. "Today the river has changed drastically due to the impact of increased human population; most of the animals still exist, although perhaps not along or in that portion of the river Chris knew. "Chris has devoted his life to learning about the Earth we inhabit and to teaching others. His insights and appreciation of the life that surrounds us are invaluable and thought provoking, especially in today's times. He encourages each of us to consider our impact on the sustainability of our amazing world." "As an admirer, it is such a joy and special gift to get to experience his youth with him in this book and learn wonderful things about species' natural history that I have never taken the time to get to know in such depth. His stories describe how he connected and maintained an amazing relationship with the natural world as a kid and the precious gifts it gave to bravely walk a very difficult, but vital, path for rest of his life. It is incredible the depth and breadth of what Chris observed and learned. Seeing how he put himself so fully in it and the joy of what he got to see and experience from it was like experiencing it myself every bit of the way. It even made me feel like a kid again getting to know the natural world with him. It is a wonderful example of how the natural world touches us and gives us the substance we need to become great people. 'Now, come with me into yesteryear and rest peacefully for a while along the banks of the river of my youth.' This book is relaxing and fun, like reoccurring walks in nature with a marvelous naturalist friend."